Polaris Industries has worked with ODC since the early 1990’s to provide a variety of employment opportunities to individuals with disabilities; providing work for ODC clients in Thief River Falls, International Falls, and Roseau. George proudly displaying his ODC Job Coach name tag for Polaris Industries in Roseau, MN. ODC in Roseau, provides staff for the first and second shifts at Polaris, running the cardboard baler. 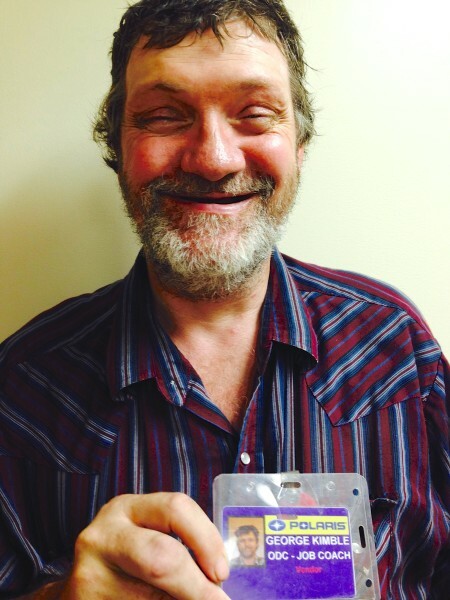 George Kimble, an ODC client, has worked the first shift since 2005. It was obvious to many that Kimble loved his job. His eagerness to take on new tasks and responsibilities did not go unnoticed. “It feels great to be a Job Coach,” Kimble stated proudly. George and his crew at Polaris Industries in Roseau, MN. ODC is proud to find work for their consumers and even more proud to hire them as part of their staff. George was hired as the 1st shift Polaris Job Coach on July 24, 2015. Congratulations George and keep up the great work!